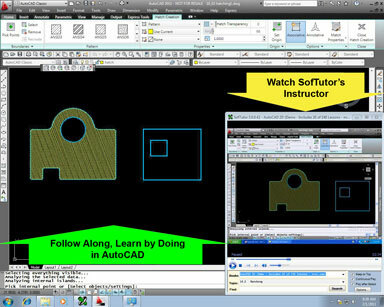 SofTutor is the Easiest & Fastest way to learn AutoCAD! Guaranteed! Learn AutoCAD up to 5x Faster! Without SofTutor "Video Training" is just a Lecture! Visit SofTutor.com and try a free sample today! Try a Free 90 Min - 2D & 3D Demo Compare it to your current training and support methods. 100% Video, Learn by Doing - Hands On Lab Format. 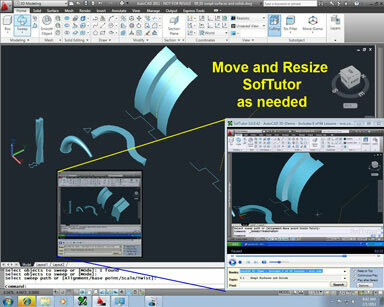 Each AutoCAD Tutorial has a corresponding example file. Open the same example file as our instructor and follow along with him, start where he starts, finish where he finishes. Learning with SofTutor is so fun you won't even know you are learning. Quick Tech Support Most Tutorials take you to the beginning of a topic. SofTutors automatically fast forward to the spot where the topic is being shown and pause automatically after it has been explained.